If you would have asked me a few days ago, I would have told you, “I hate Lent. I dread it.” I have been practicing Lenten observances for a relatively short period of time. I’m a convert to Catholicism, and the other denominations I practiced never made a big deal of the Liturgical Calendar. As a new Catholic, I was learning all about God and my relationship with Him in the sacraments, especially in the Liturgy of the Eucharist. The sights, sounds, smells, and tastes were all different and new. Therefore, the ebb and flow of the liturgical seasons was not even on my radar; I could only take in so much at a time. Then, thanks be to God, a good friend of mine humbly walked with me. I watched him experience Lent joyfully. The sacrifice was beautiful. He made me want to participate in it, even the hard stuff. You see, I’m a very “fleshy” person. I think we all are. God came to us in the flesh for a reason. Incarnational realities, when ordered correctly, draw us to Him. For example, I recently saw a bright, beautiful chandelier at a restaurant in downtown Des Moines. It was gorgeous enough to make me stop in my tracks; it captured my attention, and I had to gaze at it in wonder. What did it say to me? “I am a small, sliver glimpse of God’s Beauty.” Another example might be when I’m shopping and I find the perfect pair of shoes for 75% off. It’s the last one and just my size. That’s God’s hand. His way of romancing me. He’s put them there in His providence. Also, the songs on the radio, whether Christian or secular, they whisper His love in my ear. I’m convinced the song Yellow by Coldplay is one of the holiest songs that exists. In my Christian consciousness, this is God the Bridegroom singing to His Church, telling each one of us that He made the world beautiful for us as a gift. “Look at the stars, look how they shine for you…” These are the thoughts and experiences that run through my mind and heart on a daily basis. But in Lent, the extravagant beauty is replaced with simple, austere beauty. There is a fast from shopping, and music is replaced with silence. This leaves my heart screaming, “Where are you God?” And then in God’s providence, I realized the story of the Samaritan Woman takes place in Lent. I almost fell over. The Church, in her wisdom, puts the story of the Samaritan Woman in Lent?! This is not a story of God moving away from the woman. This is a story of God moving toward her. It is a story of intimacy! God the Father sends the Son to pursue the woman at the well, and He offers her the Holy Spirit (symbolized by the water), the very life of God! She receives it; takes it into herself, and never lives an ordinary earthly life again. Now her life on earth is a communion with heaven; the Triune God who made her now animates her every thought, word, and deed. She has received Love Satisfied. She finds fulfillment. She is finally happy. In her joy, she gives this gift to all because she realizes that this is what she was made for. Lent is not a time for God to move away from us; it is a time to become detached, stripped — so He can move ever closer to us. We are praying for you! We pray that you would join us and the Church. 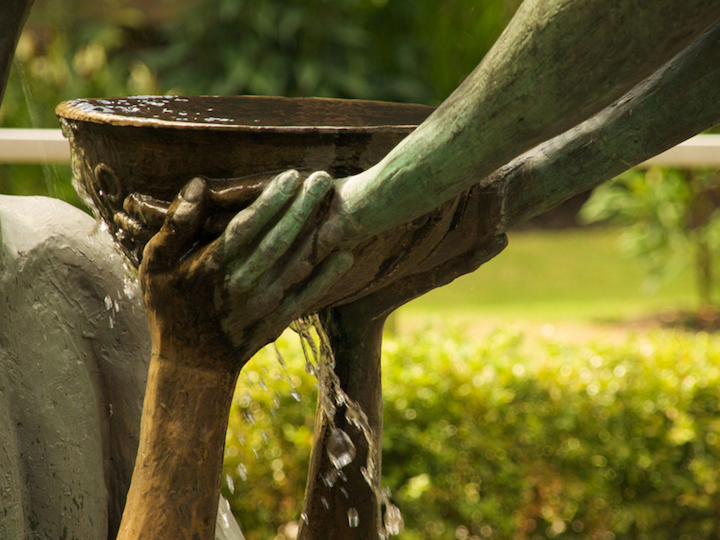 Revisit the story of the Samaritan woman. It is the Gospel reading for this Sunday. Hear God speak to you from the depths of His heart, and we pray that He will give you great graces to receive Him. Have you saved the date for June 24? We can’t wait to see you at The Well 2017! Tickets go on sale April 24 (did you catch that, TICKETS GO ON SALE APRIL 24! ), and we’re working diligently to update the website with all the wonderful details about the gathering. More soon! This entry was posted in Lent, Reflection and tagged Blog, Blog, John 4, Lent, Samaritan Woman. Bookmark the permalink. I love your insight, Brooke!